The Club Committee Induction and Training Course is designed to give you a broad base of knowledge that will allow you to gain a level of understanding of all aspects relating to running a club. We like to think of it this way, if you were made the president of your club and had no idea where to start, our Committee Induction and Training Course is the place to get the knowledge to help you and your club meet its objectives. This course is also a great way to train new committee members so they don’t feel like they have been thrown in the “deep end”. There are 14 videos that will take you through the first starting steps of your responsibility, right to the nitty-gritty of club finances. 14 videos may seem like a lot, but it’s important to break it down into manageable bites so that you come out with a strong, clear understanding of where to go next. This training will fill the gaps in your knowledge, and if you have any questions… ask us! Plus, our newsletter will continue to support you with fortnightly grant opportunities, resources and articles full of insight into club life. Got a question about this course? Email us at admin@sportscommunity.com.au for more information. Sports community went above and beyond in working with us to provide development opportunities for our sporting clubs. Their vast array of options allowed us to hold both a face to face session and webinars - this was pivotal in reaching a wider network of people. In addition, sports community were very accommodating with discussion topics we wanted to present to our clubs, and offered to design content to reflect our needs. Their friendly and approachable staff made the experience very positive and I could not recommend them highly enough - definitely would utilise their service again. 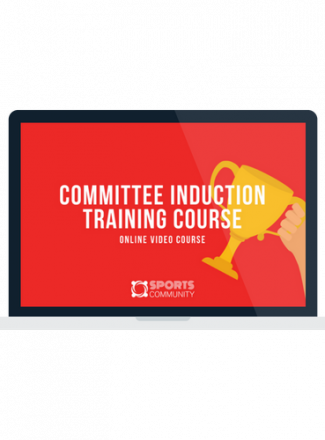 "I have really enjoyed the Sports Community webinars and found them valuable and informative. "It has captured some real challenges that are faced by the sporting community with some simple yet effective skills to pass onto our clubs." "The whole team at Sports Community has been great to work with. "They are always positive and quick to reply. One-hour webinars every couple weeks are perfect as they don't take too much time out of your busy work schedule. "Presenters of the webinars make potential complex issues quite simple and the recordings of the webinars are a great idea. "They have been helpful a few times when I have gone back and reviewed some of the content." "We have worked with Sports Community on a number of projects, however most recently they assisted with the recording and production of three online training videos. "Joe made us feel comfortable in our delivery and the turnaround time was exactly as quoted. "The end product was exactly what we’d hoped for and I’d have no hesitation in recommending their services." "Bowls Victoria has enjoyed a successful partnership with Sports Community to develop and deliver a whole-of-sport club training program over the past two years. "The program was managed well and to expectations with training programs staged in metropolitan and regional areas across Victoria. "Very positive responses were obtained from attendees with benefits being experienced by clubs virtually straight away. "Bowls Victoria is confident recommendations in respect to our relationships with Sports Community are based on accurate feedback from our client base and our own individual dealings through its management and staff." "We are very grateful to Sports Community for their help in our Strategic Planning Process. "They were able to assist us from the beginning and made sure all of the important groups were represented. They led a positive and effective meeting that resulted in very strong goals for our club. "The stakeholders of our club have also reacted positively to our direction thanks to the additional communication. We are excited to continue to work together to see our objectives are achieved." "I have worked with Steve and Sports Community for a number of years and have found them very accommodating, relaxed and knowledgeable. "The workshops Sports Community has delivered have been at the perfect pitch for grassroots clubs, full of practical and easy to implement suggestions. "Sports Community’s online learning makes it even easier for clubs in country areas to access training and information. Totally recommend Sports Community." Time to make your role at your club a whole lot easier? When does each course start? You can log in to your session 30 minutes before the scheduled start time. This is a great opportunity to check your connection as well as make the most of the time with your presenter and other participants. During this 30 minutes you can ask any questions specific to your club and ensure you get the answers you are looking for. How many times can I access the online course? For most courses you will not only receive the webinar training but also a worksheet and links to the best resources in the country on your training topic. Steve's vision of a one-stop shop for all grassroots sports club where club volunteers and administrators can learn, share and grow has come to fruition in Sports Community. His passion for working with local grassroots sports clubs led him to developing Sports Community from just an idea into a multimedia information portal with a thriving online community. Meaghan presents our webinars and consults with grassroots clubs, as well as councils and peak sporting bodies about how best to maintain successful and sustainable organisations.